Kepler-37b, about the size of Earth's moon, orbits a sun-like star 215 light-years away. The smallest exoplanet yet found orbits Kepler-37, a sun-like star located about 215 light-years from Earth. Only about the size of Earth's moon, Kepler-37b is probably a rocky and airless world similar to Mercury. Kepler-37b has a diameter of about 2,400 miles (3,860 kilometers). It takes 13.4 Earth days to orbit its parent star. 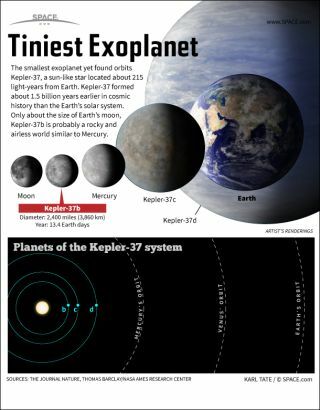 Two other known planets populate the Kepler-37 system. Kepler-37c has about three quarters the diameter of Earth and orbits its star in 21.3 Earth days. The third planet, Kepler-37d, is about twice the size of Earth and completes an orbit in about 39.8 Earth days. The three Kepler-37 planets all orbit within the radius of Mercury’s orbit around the sun. Due to its size and high level of surface radiation, tiny Kepler-37b is thought to be a rocky exoplanet like Mercury, with no atmosphere or water. The star Kepler-37 formed 6 billion years ago, about 1.5 billion years earlier in cosmic history than the Earth’s sun. Kepler-37 is about 97 percent as bright as the sun, and has 0.8 of the mass of the sun. Only since 2012 have astronomers had the capability to detect planets smaller than Earth in other solar systems.